Social Media is a powerful way to create engagement by publishing alumni generated content. Not only it gives former students a platform to voice opinions and feelings but it also brings a sense of belongingness, recapturing all the memories. It is a vital way to connect with the Institute’s stakeholders. The connect with alumni brings a lot more to the institution, not only in terms of advocacy but also in terms of funds, corporate relations, student mentoring, and more. It is important to understand the alumni behaviors, how often they are being invited to college, how well they have received due respect from an institute, how much value an institute has created for alumni. All these questions should be answered in a substantiating the facts. This campaign will highlight the importance of digital media in answering the raised questions. To relive and create nostalgia about what they have learned, celebrated, enjoyed during campus life. User-Generated Content promotion over social media, leveraging the power of social media to celebrate the joyful friendship day through Twitter. Created a google sheet, explaining alumni as to how and what to share, along with link description in the doc. The objective is to generate alumni created content where they can share, likes and create their own theme posts. The campaign focuses on keeping a special day a crucial factor to connect students in terms of friendship. The campaign was all about sharing pictures of celebrations, unforgettable moments with college friends, creating an aura for hashtag #GLFriendsforLife. “Greeting from Great Lakes Alumni Association Delhi Chapter ! Years pass by, things change, but college friendship remains the same. We all miss our college days and those few friends/friend who made those days more special. Cherishing those never-ending talks, class bunks, after college hangouts and tons of happy memories often bring a smile to our face, even after the years of graduation! 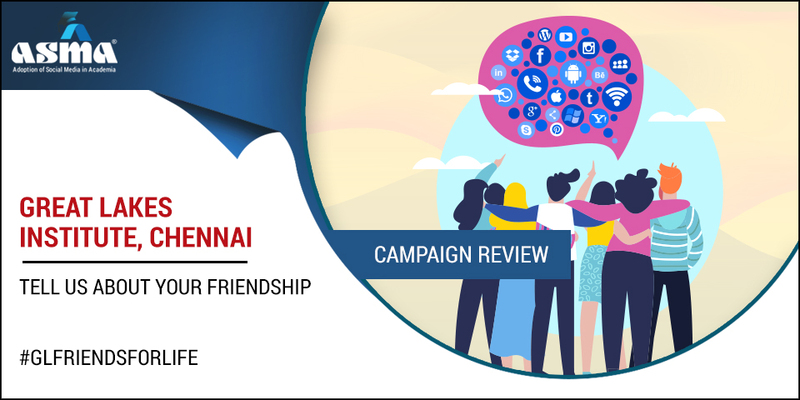 The campaign is self-initiated by the alumni of Great lakes Institute on specific “Friendship Day”. They leverage the social media to cherries the memories, sharing their nostalgic moments, group dinners and games they had at the campus, and tell us about your friendship. They mainly focus on twitter handling for this. The posts are full of nostalgic pictures they clicked on campus, how long its been they haven’t celebrated or cherries those memories. The videos in form of short storytelling covering best of the pictures they had, tagging other colleagues in the post. The reply back, the thread was created to boost the engagement level. The alumni are replying back in the way posting other stories at the campus.